Champion Ironman Zane Holmes' dedication to Surf Lifesaving led him to create the Medibank Wave Warriors Junior Challenge, an annual event now in its 4th year which attracts competitors from across Australia and New Zealand. 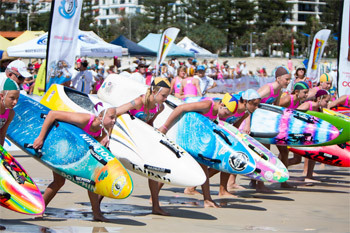 Open from under nine to under fifteen year old competitors, Medibank Wave Warriors Junior Challenge is a beach and surf spectacular, set up to mirror the famous Kellogg's Ironman series and promote further development for junior lifesavers in this iconic Aussie sport. 'My goal was to create a unique ocean and beach spectacular for junior lifesavers (Nippers) so they can come together from around Australia to participate in an exciting competition," said Holmes. 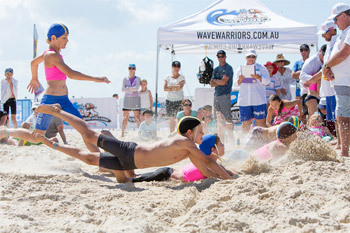 The Medibank Wave Warriors Junior Challenge has events across all surf sports disciplines with individual events such as beach sprint, beach flags, surf race, board race and iron person and team events including surf teams, board relay, warrior relay and a two kilometre all age beach relay. The competition is about participation and fun - encouraging our youngest athletes towards a healthy and active lifestyle and encouraging them to continue their participation in the sport and to become future volunteer patrolling lifesavers at their local surf lifesaving clubs. 'Medibank is proud to be the naming rights sponsor for the Wave Warriors Junior Challenge," said Laz Cotsios, Group Executive, Private Health Insurance, Medibank. 'We love Wave Warriors because the events reflect so much of what we are about – families, community connectedness, being active, and building health habits from a young age. Our For Better Health focus spans Australia and New Zealand and it is pleasing to find a partner who echoes our sentiments, connecting with the community, families and being active," said Cotsios. Zane has a 40 year family history in surf lifesaving, beginning as a Nipper and now at the pinnacle of his sport. He is the most successful Ironman in Surf Lifesaving history. For more information about Wave Warriors go to: www.wavewarriors.com.au. For more information on Medibank go to: www.medibank.com.au. Question: What inspired you to create the Medibank Wave Warriors Junior Challenge? Zane Holmes: I felt that I needed to improve on what was currently on offer for juniors in Australia. Not much has changed in nippers since I was a nipper 25 years ago! Question: What is the Medibank Wave Warriors Junior Challenge about? Zane Holmes: The Medibank Wave Warriors concept is to provide a fun and relaxed atmosphere for kids to compete in a professionally run event. The end goal is to retain as many kids as we can in the sport. Question: How has the event changed over the past four years? Zane Holmes: The same core principles apply however we have just improved the efficiency and way we conduct the event. Question: Can you talk us through how participants from each state qualify for the national finale? Zane Holmes: There is no qualification process. Each event including the final round is open to all nippers around Australia and all levels of ability. We want to give every nipper in Australia the opportunity to experience Wave Warriors. Question: What do you hope this challenge teaches children and their parents? Zane Holmes: We'd love to see kids learn how to build great sportsmanship. This means competing fiercely but fairly and doing it with a smile on their face no matter if they finish first or last. We also want to see great friendships formed which will last a lifetime. Question: What are the most important things parents should remember when their families are around water? Zane Holmes: If they're at the beach, the number one rule is to always swim between the red and yellow flags. This is the safest place to swim as this is where the lifesavers can see you. Question: How does the Medibank Wave Warriors Junior Challenge teach children about the importance of water safety? Zane Holmes: Participating in nippers teaches kids the basics of surf safety. This includes how to identify and avoid rips, first aid, what to do if they find themselves in danger in the surf and basically builds confidence in the surf environment. Question: What are your top three tips for children to remember when they're around water? Question: What originally inspired your love of Surf Lifesaving? Zane Holmes: I followed my two older sisters into nippers and my dad was also a keen lifesaver. Question: What advice do you have for young Australians who want to follow in your Ironman footsteps? Zane Holmes: The most important skill to have is knowledge of the ocean. The only way to learn this is time spent playing and surfing.